Sony's new Google Assistant smart speaker costs £200 | What Hi-Fi? Sony has launched its first Google Assistant smart speaker at IFA 2017, featuring Bluetooth and wi-fi streaming, 360-degree sound and gesture controls. The Sony LF-S50G speaker has Google Assistant built-in, meaning you can control your smart home and supported devices by barking commands at the Sony speaker, whether you want to play music, set cooking timers or control your Philips Hue lights. Being Sony, the company has focused on audio quality as well as the smart stuff. On trend with rival omnidirectional speakers such as Amazon Echo, Google Home, Bose SoundLink Revolve and the upcoming Apple HomePod, the Sony LF-S50G features a 360-degree speaker design. Inside, it has a full-range driver and a bass driver, positoned to fire at each other (with the bass driver on top, firing down on to the single driver) and a diffuser plate in between them that spreads the sound around. 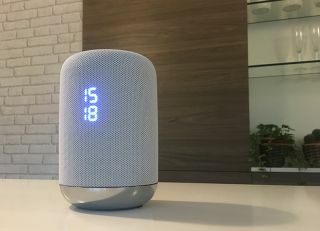 You can stream songs to the speaker using Bluetooth or wi-fi, and it has NFC (Near Field Communication) one-tap connection. There’s a handy clock display, too. If you get tired of saying “OK Google” umpteen times a day, you can use the speaker using gesture controls. Simply wave your hand on top of the speaker to activate it. You can also wave left and right to skip tracks or make a circular gesture as if you’re turning a dial in order to change the volume. The Sony LF-S50G comes with multi-room functionality, too. It can link up to any other Chromecast-supported Sony product to stream songs around your home. The Sony LF-S50G is available in black or white in the UK, while the US gets a third blue option. The cylindrical design is covered in a water-repellent textured material and has a chrome base. The LF-S50G is IPX3 rated, meaning it’s splash proof and water resistant. The cover is removable as well. Sony's smart speaker costs £200 and is due in shops in November 2017.